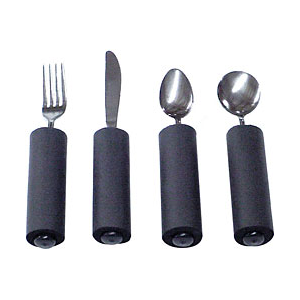 This set of Soft Foam Built-Up Handle Utensils is perfect for anyone who is working on their grip in rehabilitation. Each set includes a fork, knife, teaspoon and a soup spoon providing easy grasp for those with arthritis or limited hand involvement. Foam handles may be removed when grasp improves. Plastic inner handle is approximately 5/8 diameter. Overall diameter is approximately 1 1/2. Stainless steel utensils. Non-returnable item.